Agile is a key enabler for the way we want to work in government. Chief Information Officer, Rob Bollard, talks us through how IP Australia is embracing agile approaches in delivery and governance. IP Australia is driving an ambitious transformation agenda. We’re putting our customers at the center, and using approaches like agile, continuous delivery and DevOps, to transform the way we operate. As part of our major business transformation program – delivering our IP Rights in One (or RIO) initiative - we’ve produced great outcomes for the agency which has helped frame our thinking about what future delivery should look like. We’ve seen great leaps forward in our ability to deliver value more frequently to businesses and customers. As we continue to evolve, we also need to modernise how we handle governance, and how we challenge embedded thinking, approaches and principles. IP Australia has recently undertaken the largest business transformation in our proud 100-year history. We migrated more than 500 million records from an ageing mainframe to deliver an advanced digital intellectual property (IP) system. The new IP Rights in One system supports business outcomes for Australian innovators and optimises processes for our staff. A key enabler for this – our delivery approach. We’ve run this major program using agile, bringing forward customer value and delivering real business benefit. You may have seen some of the deliverables of this work, including our award winning Australian Trade Mark Search system which has been “live” on the DTA’s performance dashboard for some time. This was our first use of the DTA’s Digital Service Standard, and we now use it for all our work. As a result we’ve transformed our IP examination, research and administration systems from dated and inefficient, to a responsive, agile and modern platform. This helped us create a world-class capability that supports better customer experience, reduced technical debt and leverages machine learning and automation to improve efficiency. We’re really proud of what we’ve accomplished so far, and have some great digital products in the pipeline. But one thing that needs to evolve in line with our delivery approaches, is the way we govern our projects, products and operations. We’re moving to a world where cloud, as a service, DevOps, automated testing and continuous delivery are becoming part of our DNA. This brings an opportunity to rethink what’s required from a governance perspective. How does automating delivery pipelines affect change control? How do we effectively manage governance of a multi-cloud environment? How do we run program boards that imbue the spirit of continuous improvement? How do we shift to thinking about things from a product lifecycle view rather than a project-centric view? These questions are important as we start to deliver with more agility. We need to make sure customers and business understand the value of continuous improvement without the need to understand the technical aspects. Conversely, we need to manage our customers as they increase their expectations, seeking more improvements, faster and cheaper. We’re trialing new approaches to solve some of these problems. 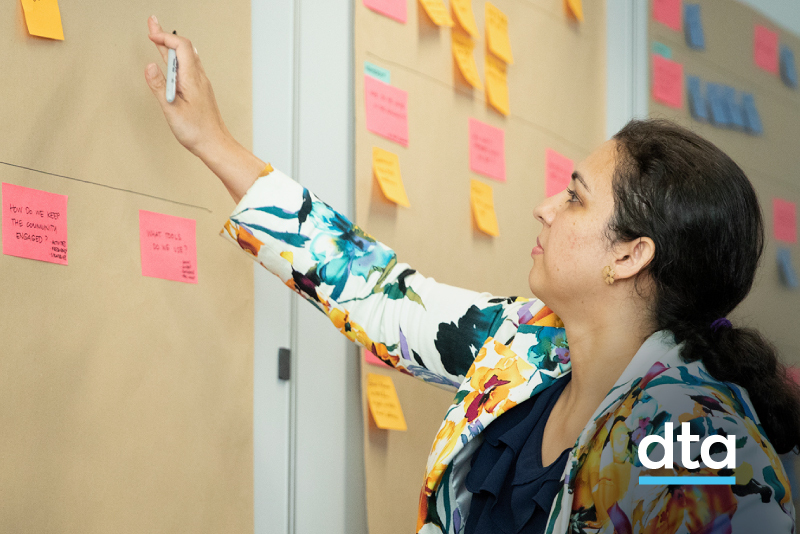 In our key customer facing program of work, we are seeking to embed an agile governance approach. This program is delivering customer efficiencies and improving user satisfaction with our transactional platforms. It’s a great opportunity to experiment and shape ourselves as a test bed and thought leader for innovation within the public sector. We run the board for this program a little differently. We have short, dynamic stand-ups with board members each fortnight. We don’t have huge amounts of excessive papers, we use electronic dashboards to visualise progress, focus on benefits, track risks and issues, and facilitate key decisions. Minutes are captured digitally and sent out quickly, with the entire process for a meeting usually closed within 1 working day. This frequent and short approach brings a different focus and mindset. The frequency requires information to be at the right level. Management is by exception, metrics are clear and visible, and the board empowers the team to deliver in a high-trust environment where decisions are made within the delivery team wherever possible. Program information is always digitally accessible and highly transparent. This creates a clear line of sight between risks and mitigating actions and enables board members to see where tasks are up to and be notified of changes electronically. In the spirit of agile, we do regular showcases and retrospectives to improve how we operate, demonstrate success and build business buy in. We’ve got great appetite to experiment and push the envelope around how we deliver digital outcomes. You’ll see this in a recent article from our Director General Michael Schwager talking more about our innovative approaches throughout the agency. In terms of ICT in government, we’re proud to be at the forefront. By embracing DevOps and continuous delivery we’re turning modern approaches into the status quo. It’s an exciting time to be in our Innovation and Technology Group and at IP Australia generally. It’s our goal to keep pushing the boundaries to give other agencies inspiration to try new things. Most importantly though, these approaches make things better for customers, business areas and staff. Users want a fast turnaround, and continual delivery of features. Contemporary approaches and the right governance can deliver this. And by creating an environment where our delivery teams can see customer value being delivered, we create a place that attracts and keeps talented staff. There’s no one-size-fits-all, but by focusing on outcomes and delivering value early and often, everyone wins. Rob Bollard is the Chief Information Officer at IP Australia.